Ashish S. Raheja, Managing Director, Raheja Universal Ltd has over a decade of experience and is responsible for land identification & acquisitions and project conceptualization. He has driven Mega Projects in Residential and Commercial segments.As M.D. of Raheja Universal (Pvt.) Ltd. (RUPL), Ashish is accredited for his dynamic leadership and transforming the company from a family-owned enterprise into a professionally-managed Corporate. He has over a decade of experience and is responsible for land identification & acquisitions and project conceptualization. He has driven Mega Projects in Residential and Commercial segments. Raheja Universal Private Limited was incorporated on March 28, 2003. 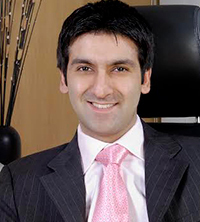 The company is headed by Mr. Suresh Raheja & his sons Rahul & Ashish. The company and its promoter group have completed development of over approx 6.05 mn sq. ft. of real estate in the Mumbai Metropolitan Region (MMR) across 46 projects. The company was chosen as a Business SuperBrand 2008, Consumer SuperBrand 2009-10, Consumer SuperBrand 2011-12 and Power Brand 2012. Brief us about the current and upcoming projects for the road ahead? The company, till now, has completed projects in the residential space includes names like One, Altamount Road, Raheja Anchorage, Raheja Atlantis, Raheja Legend, Raheja Empress, Raheja Sunkist, Raheja Sherwood. Raheja Exotica I & ll and Raheja Acropolis I & ll. The ongoing projects includes Raheja Imperia, Raheja Ridgewood, Raheja Exotica, Raheja Reflections Odyssey, Raheja District II. What is you take on RBI policy rate cut? RBI Governor, Raghuram Rajan, in the first bi-monthly policy statement, has reduced the repo rate by 25 basis points to 6.50, which is a welcome step. This we believe will surely have a positive effect on the economy as well as across sectors at large. More specifically from the real estate sector perspective, we believe that there will be some renewed interest from prospective home buyers who were hit recently by the ready reckoner rate hike across Maharashtra. While this move is positive, it is yet to be seen whether banks will pass on these benefits to their customers. Tell us about your IPO plan? How much are you raising for IPO? Currently, we are not planning any IPO. Earlier in 2010, the company had planned to raise Rs. 850 crore via IPO. How do you see the industry shaping up for FY16-17? The major reforms has been passed by the government such as real estate regulation bill, but nothing has been done at ground level. We expect consolidation happening in the real estate sector. What price scenario do you see for the coming fiscal? We expect real estate prices at current levels. What is your mix in terms of residential and commercial? About more than half of our revenue comes from residential side. What is your total area under development currently? The total area under development stands at 4.17m sq ft.